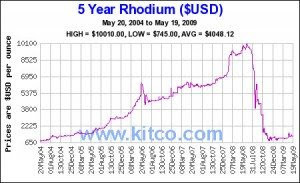 Rhodium demand has been steadily increasing nearly each year in the 2000s. 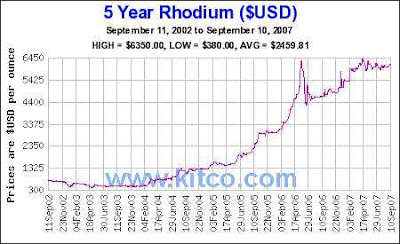 The total demand rhodium in 2007 was 856,000 ounces. Overall demand increased by about 2%. The demand for rhodium from the auto sector alone was 879,000 in 2007, a 2% increase from 2006. This increase was mostly due to increased automobile production in China, India, and Russia. Keep in mind that in 2007 the auto-industry hadn't yet felt the full shock of our current economic crisis. Demand also grew in North America largely due to the production of medium sized diesel engines. In Japan demand fell since, due to the rhodium price trading $5-7000 per ounce, car makers used stockpiles of the metal instead of buying more. Europe is producing more and more light duty diesel engines which may use little to no rhodium. Therefore demand in Europe fell as well. Notice that the auto sector required 879,000 ounces of the metal whereas supply in 2007 was just 856,000 ounces. The supply is met considering that 183,000 oz of rhodium were recycled, mostly from used catalytic converters. Rhodium demand edged up less than 1% in the glass sector. In North America and Europe some glass factories have shut down. But in Asia and India demand increased for flat panel TVs and computer monitors, thus increasing worldwide demand in this sector overall. Demand would have increased more had some manufacturers not substituted platinum, which was trading about 20% the rhodium price, for some production. There has never been much of a demand for investment rhodium. Part of the reason is that rhodium is fairly brittle by comparison to gold or even palladium and that stamping into a coin would cause the coin to crack a bit. It was available in rhodium dust, called rhodium sponge, however, this generally wasn't available to the general public. However, rhodium coins are now available as the Cohen Mint will soon be making rhodium bullion coins for investment. 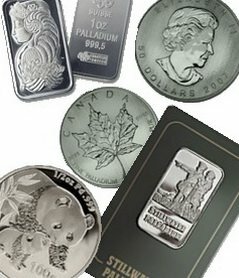 If you want to read more about nonexisting rhodium bars and other type of rhodium investing, there are several links in this rhodium article. The supply Rhodium increased by 3% to 822,000 ounces worldwide. The two main countries producing rhodium, however, showed slight decreased output. In South America less PGM ore was mined therefore overall rhodium production decreased. Russian production fell slightly as well. Since Russia is so valuable a rhodium mine country, shipping interruptions are a main factor that helped push the rhodium price to nearly $7000 in 2007.